So far, a certain amount of Jessica Jones’s sophomore season feels a little mechanical. Characters appear to be making choices and taking risks that seem to both delay the inevitable and cause unnecessary conflict. In part this feels like classic story-telling 101; we can’t burn through all the best reveals at the very beginning. But this is also Jessica Jones, so characters making the wrong choices and messing things up runs right into the DNA of what makes it such a fascinating series. 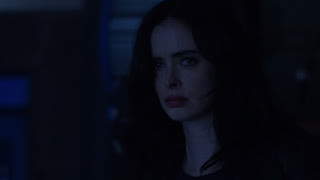 Jessica’s discovery of Kozlov’s lab at the end of the premiere leads her discover that he’s now one of the victims of whoever, or whatever, has been going after those connected with IGH. Her visit to the doctor’s wake leads her back to Will Simpson, where an angry patient blames the former officer for Kozlov’s death. An accusation like that is certainly plausible, since Jessica witnessed his destructive side first hand when he attacked her and Trish last season. Trish’s own investigation into Jessica’s missing time forces her to come face-to-face with a different man from her past; a director she once slept with in order to land a part in one of his movies. The most significant part of this development is that she was 15 when it happened. It’s interesting that both Trish and Jessica have gone through sexual trauma in their past, yet they’ve both handled that trauma very differently up until now. I do like that Trish would go after this creep all in the name of helping Jessica. Judging by the nerves she was displaying before confronting this guy, she’s still feeling the after-effects of what he did, so it took a lot to meet him let alone call him out. Both Trish and Jessica try to keep each other at arm’s length in order to protect the other in this episode, but this is what ends up causing them to face roadblocks on their way to the same discovery. It’s hard to watch and think how much quicker they’d both be if they worked together, but these decisions are clearly symptoms of their long and complicated relationship. They both want to help each other by doing the dirty work themselves and though it causes some stilted momentum, it’s certainly organic from a character building perspective. One of the more frustrating elements of this episode was Will secretly trailing Trish. I can’t help but feel it would have been far more beneficial for him to come clean to either his ex, or Jessica, about what he found out and why he’s been following the radio star around New York City. Surely Jessica would have been in a much better position to protect Trish if anything came to hurt her. He wasn’t thinking clearly though, so perhaps he wasn’t in a position to make rational choices. In any case, I can’t help but feel Will was destined to end up the same way he did in this episode no matter what he did. He was playing with fire the moment he asked for Kozlov’s help back in season one, and by the looks of things he was already knocking on death’s door before the still unknown super-powered killer pushed him over the threshold by giving his head a good 180 spin. RIP Action Man. Things are also looking pretty bleak for Hogarth. We still don’t know what her mysterious medical diagnosis is, but it has been causing her to go through what looks to be some sort of existential crisis. She asked one of the girls she was “partying” with if she believes in karma. Does Jeri blame her past actions for causing her diagnosis? That might also explain why she’s been delaying her joint venture with Cheng. Perhaps she’s starting to feel remorse for those she’s hurt on her way to the top of New York’s food chain and doesn’t want to hurt anyone else. I wonder what choice Jeri will make from here. Some fun comic book references here: the “with great power” line in Whizzer’s confessional and Jessica’s “scrotey sense” comeback were both fantastic. I really don’t buy Sinclair’s innocent act. There’s no way he’s not evil, especially if he has an accent. This is a Marvel show after all! I love how protective Malcolm is of Trish in this episode. It’s also nice to see him help out someone other than his loveable, but surly boss for a change. Shout out to Carrie-Anne Moss who blew it out of the park in this episode. Her performance felt like it encapsulated the perfect amount of sadness, confusion and guilt. You could really feel all the pain she was going through. It’s been a bit of a slow burn so far, but despite a few plotting contrivances this season is still full of just as many great character beats as the first. Both Trish and Jessica try to keep each other at arm’s length in order to protect the other in this episode, but this is what ends up causing them to face roadblocks on their way to the same discovery. Yeah, I found this frustrating, too. For pity's sake, Trish, answer your phone! Jeri must be dying. I thought that scene with her dancing with the prostitutes was fascinating instead of uncomfortable. Beautifully acted and shot. I'm glad that the mongoose was (about to be) found by the cops. Although the aquarium of live mice as treats? Ick.